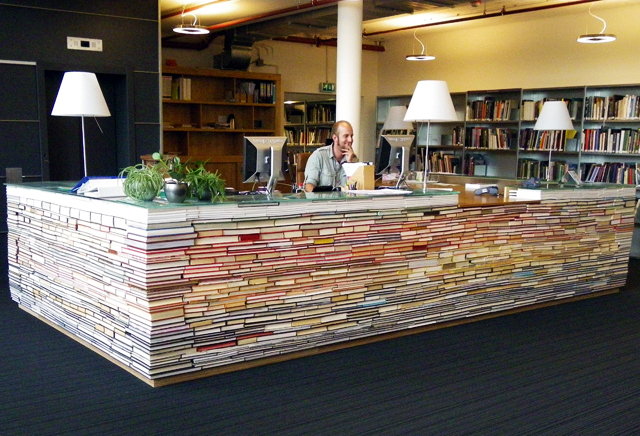 The new architecture library at Delft University of Technology just opened featuring a spectacular front desk built out of recycled books. After the devastating fire in the Architecture building that took a portion of the library's reserve, the school set out to establish a new collection that would consist of the salvaged books that went unburned and a bounty of others newly purchased to replace the destroyed volumes. Opened less than a year after the engulfing inferno, the new library is a bright, cheery space of architecturally inspired elements and stacked to the brim with an endless amount of books! The colorful and carefully arranged desk is a testament to the school’s love for design and books. The strong, solid corners give the desk a solid foundation and the pattern has been arranged so that in some instances the spines of the books are turned out to reveal the title. Recycled books, journals and magazines were used to construct the desk, which was then topped with glass to provide durability and stability. After such a devastating loss with the destruction of the original Bowkunde building, for the Faculty of Architecture and their students, the opening of this modern, bright and fun space to study and convene was a much needed breath of fresh air. The new library includes collaborative study areas, computer stations, cozy seating, and above all, an entire collection of architecture books making it the ideal haven for architecture students and staff to escape. UPDATE: The temporary facilities for TU Delft Bouwkunde were designed by Delft-based Fokkema & Partners. It was dark when I woke. This is a ray of suhnisne. @pscholte, thanks for including a link to the designers! that is so cool!! i hope it doesn't tip over. 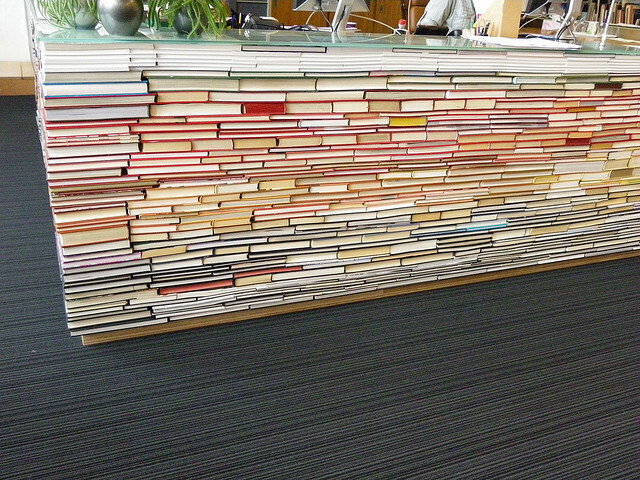 The recycled book desk is made out of hundreds of books neatly stacked together. Colorful and sturdy, the book desk serves as the library's information desk situated in the center of the library. The desk is topped with glass to keep the structure sturdy. The new library opened in January of 2009 -- less than a year after the devastating fire at the Faculty of Architecture building at TU Deflt. Luckily many of the books were recovered and the collection was rebuilt. The new library is located at Julianalaan 134 and features many modern conveniences, making it a convenient and beautiful place to study. Modern and contemporary lounge chairs provide comfortable enclaves to study and gather in groups. Cozy couches are distributed throughout the space near shelves of journals and magazines. Work study tables provide big open spaces for students to collaborate. Bright natural daylight filters in through the windows and reflects off the white walls making this architecture library a bright and cheery space. Tall windows in a double height atrium infuse the entrance and computer work stations with ample natural light. Ultra modern, the up-to-date library actually resembles a hip coffee and book shop more than a serious library. The library features colored windows on the outside creating a much more playful and exciting destination as compared to the old building.